Four ‘Common Pipistrelle’ bats were found alive and well under hanging tiles of an old Cottage requiring demolition. Currently being translocated to new habitat in recently constructed high level bat box. Soilfix are carrying out Site Clearance and Demolition works for CALA Homes at Deepcut Barracks, which requires sensitive ecological works in conjunction with JFA..
Having enabled two major archaeological investigations on our brownfield reclamation projects during 2018, Soilfix have commenced 2019 with another major archaeological investigation in Rainham, Essex. Whilst carrying out remediation & enabling works to facilitate ongoing construction by, 10nr trial evaluation trenches were excavated during Autumn 2018. Several trenches identified features of interest, including burial pits..
Soilfix have just taken delivery of its second brand new Stehr soil mixing attachment courtesy of Reeds Civil Engineering. After Soilfix were the first company in the UK to adopt this technology, this excavator mounted attachment has been in such demand on our sites throughout 2018, we have decided to purchase a second unit. The..
Soilfix 2018 Xmas Party 2018 has been a busy year for Soilfix with record turnover, numerous challenging projects successfully completed, several new clients secured and new faces joining the team. Our get-together in Bristol on Saturday 8th December was a great opportunity for everyone to meet up and let their hair down. The Soilfix team.. 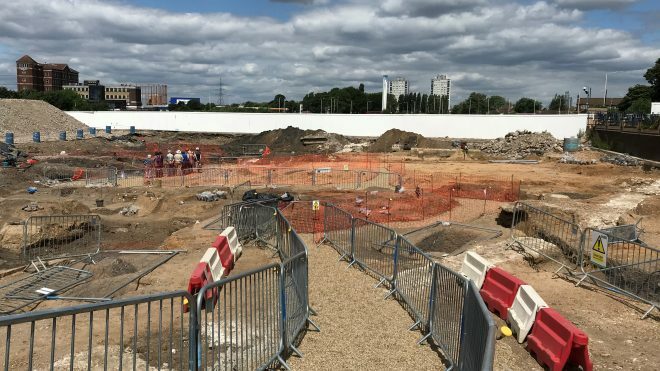 Following 10 weeks of painstaking surgical excavation, Soilfix has successfully carried out public outreach days at its Barking Wharf regeneration site to help fulfil its client’s planning obligations with respect to archaeology. A total of 5 schools from the Barking & Dagenham area visited the site, followed by more than 80 members of the public..